His brother, a 9-year-old who dove into the water to try and save him, remains in critical condition at Maine Medical Center. AUBURN (NEWS CENTER Maine) — Search crews battled strong currents Friday in the fourth straight day of searching the Androscoggin River for a missing 5-year-old boy. Operations were concluded that afternoon, a police said diver search options for the river have been exhausted. Auburn police said recent heavy rains and spring runoff had contributed to worsening river conditions. The current was measured to be running three times faster Friday than on Wednesday. Despite the difficulties, wardens planned to search the river using boats and a sonar unit. Crews' search Thursday focused on the area between where the 9-year-old was rescued and rapids about a half-mile downstream. The 5-year-old disappeared into the river on Tuesday. His 9-year-old brother, who also fell in the river, is in critical condition at Maine Medical Center. He was rescued by firefighters late Tuesday night more than a mile downstream from where he fell in. The 9-year-old reportedly jumped into the river to save his younger brother after he had fallen in. Search efforts for the 5-year-old turned from a rescue to a recovery sometime Wednesday. Search for 5-year-old who fell in Androscoggin River Tuesday, March&nbsp;25, 2018. Rescue crews responded shortly after 7 p.m. Tuesday to the area of Bonney Park for reports of two local brothers who had fallen into the Androscoggin River. Initial attempts by both the boys' father and 8-year-old sister to pull them from the water were unsuccessful, police said. 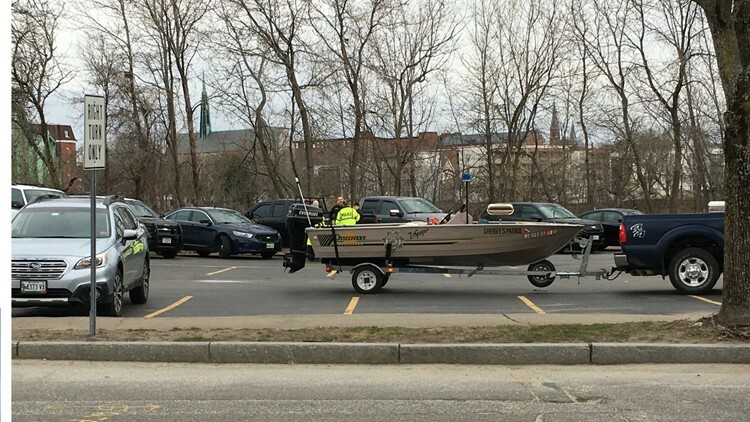 The 9-year-old boy was later pulled from the river by Auburn firefighters near Gagne & Son concrete supply company and taken by LifeFlight to Maine Medical Center, Auburn Deputy Police Chief Jason Moen said. Crews searched nearly three hours for the missing 5-year-old before being called off late Tuesday night due to what police described as hazardous river conditions. Search operations resumed Wednesday. Police said the parents were by the side of their 9-year-old son at Maine Medical Center where he remained in critical condition. Fire departments from at least four other municipalities as well as the Maine Warden Service aided in the rescue and search. A witness told NEWS CENTER Maine crews pulled the 9-year-old from the river, and chest compressions were administered. "A firefighter jumped into the water with scuba gear on, somehow they found a canoe somewhere and paddled out," said Katie Levensailore, a nursing student who lives in Auburn. "They found the body out there and they got him to shore, EMS got down there with a backboard and pulled him up." Auburn School Department Superintendent Katy Grondin told NEWS CENTER Maine the two brothers were new to the community and were scheduled to begin school Wednesday. She said they had just said goodbye to their old school this week. Grondin said they will have support at their new school, even though they didn't attend there, for students who are aware of what happened or live near to where it happened. Bonney Park is named after Officer Rodney Bonney who died in 1981 while trying to save a teenage boy who had fallen into the icy Androscoggin River.